Professor of Chemistry and Materials Science, Chair of Chemistry Dept. at the University of New Hampshire, Glen has been studying organic compounds for over 25 years. Creative marketing and sales strategist, with relevant background in both retail and product development. Track record of building brands, world-class retail experiences, and fierce customer loyalty. Critical thinker with advanced financial analytical skills, as well as cash management, debt-raising, and capital allocation expertise. Recently passed the Chartered Financial Analyst exams. Craig has outside sales experience with 4 successful start-ups in the food and microelectronics industries. Craig is powered by his constant focus on 100% customer satisfaction as the key to success! Vera Roasting Company has pioneered a new “heart healthy” category of premium coffee through a patent-pending resveratrol infusion process. Glen Miller and his team have created an innovation that changes the landscape for coffee consumers—a great-tasting premium coffee that provides additional health-related benefits. As a New England Innovation Center Resident Company, Vera and Glen Miller closely collaborate with Mark Galvin and an experienced marketing, logistics, and product launch team to position their products in the very best distribution points. This talented group has a proven track record of successfully executing innovative ideas and established go-to-market experience.Vera’s CoffVee products have created an exciting new coffee category around “heart healthy” benefits. Glen and the Vera team can use this as a foundation for future innovations as consumer loyalty expands. I’m picky when it comes to coffee. I’ve spent years bouncing between blends and brands hunting for the perfect one. I’m happy to say my quest is over! I also really enjoy offering this unique coffee to people when they come over. Great Coffee! Cool Brand! I love the idea of adding a jolt of health to my morning jolt of caffeine. It makes coffee seem less like a waking necessity and more like a healthy addition to breakfast. Physician trying to stay young. Vera Roasting is a fine product. We have been using the coffee for a very long time. It is the best coffee I have ever used. These people are very good to deal with. Very responsive if you have questions. Packaging and order process are first class. We've crafted the first coffee infused with the health benefits of wine. Vera Roasting Company is passionate about crafting a premium brew that will make your taste buds and your heart happy. CoffVee is delicately roasted, 100% Arabica beans infused with resveratrol, the all-natural antioxidant found in red wines. Enjoy the widely accepted heart-healthy benefits of a glass of red wine in every cup of CoffVee. Extract the naturally occurring resveratrol, found in the skins of grapes used in the making of red wines. Introduce delicately roasted, 100% premium Arabica coffee beans. Using a patent-pending technology developed by Vera Roasting Company, infuse beans with resveratrol. Arrive at a delicious, heart-healthy cup of CoffVee. We've already shipped to every single state in the U.S. Since its launch in December 2015, the company has sold CoffVee direct-to-consumers through VeraRoasting.com. Within nine days of the initial launch, the simple marketing message of “red wine health benefits added to great coffee” led to orders from every state in the country including remote communities in Alaska and boat slips in Hawaii. To date, our strongest sales have been in New England, Florida, and California. We continue to rapidly and aggressively build brand awareness via highly tailored marketing efforts. CoffVee has found its way into the cups of some big league brands. Our plan now is to ramp up our subscription model and land more national accounts. "The concept behind Vera Roasting Company seems very interesting because it exploits the intersection of multiple market trends and realities. To make a company like this work, the management team must have a command of the scientific processes to establish protectable IP. They also need the experience of high growth startups, and they need the operational skills to manage production, social media, and business controls. The Vera management team offers all of that, plus an esprit de corps that is essential to weather the storms of a startup." Most people have heard that red wine is a healthful drink. Indeed, people who drink red wine regularly and responsibly lead healthier lives with less disease, including a reduced incidence of coronary heart disease. Over thirty years of medical studies converge on the same conclusion: the beneficial ingredient inside the red wine is resveratrol, an all-natural antioxidant that originates in the skins of red grapes and is naturally extracted into red wine during production. As a professor of organic chemistry and Chair of the Chemistry Department at the University of New Hampshire, I have made a career of studying organic compounds. While I’ve been aware of resveratrol for nearly twenty-five years, it was only about two years ago that I decided to research the antioxidant. I was reading a paper from a medical journal suggesting yet another beneficial impact of resveratrol, the slowing of aging-related cognitive decline. I wondered, “Why is resveratrol so special?” The answer to this question is related to resveratrol’s novel structure and properties. Resveratrol is a robust, polyphenolic organic compound that has the ability to slow down or even shut down free radical processes, which are implicated in a wide range of undesirable events that impact our lives. These include food spoilage, disease progression, and even aging. I became convinced that introducing regular resveratrol into the American diet is not only an important goal, it’s absolutely essential. Many people have asked me “Why not just drink red wine?” It’s a great question. For starters, not everyone likes red wine. But more importantly, the key to realizing the beneficial health impacts of resveratrol is to consume it every day—to make it a daily part of our diet. It’s not enough to consume resveratrol once or twice per week. While some Europeans do indeed drink a few glasses of red wine each and every day, few Americans can say the same. However, roughly 85% of all US adults drink coffee and the average coffee drinker consumes three cups per day. I realized that coffee is our red wine! With this realization, CoffVee was officially under development. It took some time and experimentation to develop a method to infuse resveratrol into freshly roasted coffee beans (I’ll spare you most of the nitty-gritty, scientific details). Eventually, the technology was developed such that each cup of brewed CoffVee delivered the same amount of soluble, bioavailable resveratrol as a typical glass of red wine. A key to our infusion technology is that the resveratrol in CoffVee is both soluble and bioavailable. Resveratrol supplements in pill form, available in the marketplace, are not soluble, and consequently a significant quantity simply passes through our systems unused after ingestion. On the other hand, the resveratrol found in red wine, and now in CoffVee, is both soluble and bioavailable so that our bodies can make excellent use of it. Vera Roasting Company was incorporated in September 2015, and CoffVee was officially launched in December 2015. CoffVee has been very popular from day one. It really resonates with coffee drinkers, who love the idea of receiving the health benefits of red wine in their daily coffee. Just as important, CoffVee is a truly delicious coffee. We chose our three roast profiles (a Colombian Medium Roast, a Dark French Roast and a Mayan Decaf Roast) through exhaustive taste-testing and collaboration with a master roaster. Our efforts have paid off in a big way. Many of our customers tell us that CoffVee is the smoothest, best tasting coffee on the market. I truly believe it is. I drink CoffVee myself, every day without exception. And I love it! Our decision to bring on new investors through Wefunder will enable us to grow our business while forging new relationships. We are eager to bring on partners that love our product and the concept behind it. We want to connect with them, listen to their ideas, and turn them into CoffVee evangelists. Together, we can proliferate the planet with heart-healthy CoffVee! I thank you in advance for your interest in CoffVee and Vera Roasting Company, and I look forward to working with you! We want to make resveratrol in coffee as ubiquitous as iodine in salt or vitamin D in milk. In pursuit of this goal, we will aggressively push our offerings through intensive direct-to-consumer efforts, in addition to large retailers with a national focus. Ultimately, we want to grow revenues while continuously improving margins via aggressive growth of our loyal customer base throughout the USA and beyond. What is Vera Roasting Company? Vera Roasting Company infuses the heart-healthy benefits of red wine into the finest coffee. We are the only company to prepare coffee that is infused with resveratrol (and we have patents pending on both our process and the final product). Resveratrol is a powerful, all-natural antioxidant that is responsible for giving red wine its heart-healthy properties. Studies have shown that modest consumption of resveratrol may support cardiovascular, neuromuscular, and immune system health.So what we do at Vera Roasting Company is infuse a purified form of resveratrol into freshly roasted coffee beans. Once it's infused, the bean otherwise behaves as any other coffee bean would. You can grind it and brew your coffee as you normally would, except that your coffee is going to have the same amount of resveratrol as the typical glass of red wine. It's a great way to introduce resveratrol into your diet if you're not a red wine drinker, or only drink it on occasion. Talk about your business model. What are your prices and gross margins on your bagged coffees and K-Cups? Do you see room for improvement? Until the last couple of months—which have seen us aggressively pursuing traditional, brick-and-mortar retail channels—our focus has been on direct-to-consumer web sales through www.VeraRoasting.com. This strategy resulted in the overwhelming majority of our first-year revenue. Easy online ordering, set-and-forget subscription service options, and fast, free shipping on all orders over $25 anywhere in the U.S. are all key components driving the success of our business to date.Our coffee retails for $14.95 per bag (our medium and dark roasts come in a 14-oz. bag, while our decaf roast comes in a 12-oz. bag). We also offer K-cups in 12-count boxes, which retail for $12.95 per box. The gross margins on these products range between 60% and 70%, excluding shipping. (The exact gross margin depends on the roast variety and actual cost of green coffee, which fluctuates due to various market pressures). Depending on the destination, order quantity, and shipping service, shipping costs can account for another 15%–25% of sales, with the most common order resulting in a shipping cost of 20% of sales.Our gross margins have improved every quarter since the company’s inception last year. We estimate that margins could continue to improve by roughly 10%–12% from where we are today as we realize efficiencies with higher volumes in production, labor, and purchasing. The total addressable market for coffee in the United States is over $48 billion,with 55% of that amount spent on premium and specialty coffee. A full 85% of all adults in the US drink coffee and the average coffee drinker consumes 3.1 cups per day. The market is growing at 4% annually. The market is well-established, stable, and experiencing modest growth across most demographics. CoffVee is the first and only coffee product that includes resveratrol. Well, everyone likes to think that they don’t have competitors and that they’re the only product on the market. In the case of CoffVee, that’s really pretty true, as we have a highly differentiated product with no close substitutes. No one else is producing coffee with our unique health twist, and we have patents pending to make sure it stays that way. Of course, we realize that our biggest competition is other very highly regarded, premium coffee brands. People are not going to stop drinking coffee they like and replace it with coffee that they enjoy less, even with a significant added health benefit. This is why we spent so much time and energy developing roasts of CoffVee that beat all the best coffees on the market in double-blind taste tests. We understand that every one of our customers has the option of buying Starbucks or Peet’s or Green Mountain coffee, and we’re confident that our product beats them all head-to-head even before considering the huge value-add of the health benefits of red wine. What is "The French Paradox" and how does it relate to CoffVee? Many years ago, doctors noted “The French Paradox.” The French have a low incidence of coronary heart disease, despite the fact their diet is rich in saturated fats—exactly the type of diet that is known to contribute to heart disease. How are the French able to eat their diet and still maintain excellent heart health? This paradox is explained by their love of red wine. After 20+ years of medical studies by groups all over the world, it has become clear that the potent antioxidant resveratrol, present in red wine, is responsible for promoting heart health among the French and other red wine drinkers. Most health-conscious U.S. adults are aware of the link between red wine and better health. In the U.S., there are many red wine lovers, but we do not drink nearly as much red wine as other countries like France, Andorra, and Macedonia on a per capita basis. The U.S. is not even in the top 10 of red wine-consuming nations, per capita. However, 83% of all U.S. adults drink coffee and the average coffee drinker drinks 3.1 cups per day! CoffVee is an easy way to make resveratrol a regular part of the American diet. Vera Roasting Company created a proprietary, patent-pending method to infuse resveratrol into premium coffee beans such that each cup delivers a bioavailable form of resveratrol with the same concentration as found in a typical glass of red wine. Resveratrol is the potent, all natural antioxidant that gives red wine its heart healthy properties. The addition of resveratrol brings meaningful health benefits without changing the taste, color, or aroma of CoffVee. Medical studies suggest that resveratrol is a heart-healthy natural product. Mother Nature places resveratrol in the skins of red grapes because it is an antioxidant that helps to protect the plant from disease and stress. Resveratrol is also an antioxidant in our bodies, with numerous studies suggesting that it may help to protect us from many serious ailments including diabetes, Alzheimer’s, coronary heart disease, and cancer. Supplements are expensive and wasteful, especially resveratrol in pill or powder form. Resveratrol is not water soluble and not bioavailable in pill form, meaning that most of it is never absorbed. It simply passes through your system. Resveratrol in red wine is bioavailable because of the alcohol which solubilizes it, and other natural compounds. Vera Roasting Company’s founder is an organic chemist with 25+ years of experience studying organic compounds. He was able to steal a page out of Mother Nature's playbook by using all-natural complexation agents found in red wine in a patent-pending formulation to give CoffVee a bioavailable form of resveratrol. CoffVee delivers resveratrol in a form that our bodies can rapidly assimilate. How did you come up with these roasts? When we were first starting, we did a lot of market research on relative popularity of different roasts of coffee. We knew we needed a “medium roast” and a “dark roast.” Then we conducted taste tests to try to figure out exactly what sort of a roast we'd like to arrive at. We tasted a bunch of different coffees which originated with a bunch of different beans. Ultimately we worked with a master roaster who's been doing this for over 20 years. We settled on two roasts. The Colombian Medium Roast and the Dark French Roast. We added the decaf roast a few months later. In double-blind taste tests, our Colombian Medium Roast is preferred 5:1 over the leading medium roast and our Dark French Roast is preferred 7:1 over the leading dark roast. We definitely hit on some very flavorful, delicious coffees. Our medium and dark roasts use a Colombian bean while our decaf roast uses a “Mayan” bean, which is sourced from Honduras. People that want to lead a healthier lifestyle love CoffVee, but they're not alone.Recent medical studies suggest that the benefits of athletic training are enhancedwith resveratrol, making CoffVee popular amongst athletes including runners, body builders, and everyone interested in strength and conditioning. In fact, soon after launching, CoffVee became the standard coffee of the Baltimore Orioles clubhouse! Medical studies also suggest that resveratrol is not only a heart-healthy naturalproduct, but may also slow the onset of age-related cognitive decline. For this reason, CoffVee is popular with older Americans, especially aging baby-boomers who are increasingly looking toward supplements to maintain good health. What could be easier for Baby Boomers than receiving their daily dose of health-promoting resveratrol in a great tasting cup of CoffVee? Does the resveratrol impact the flavor? No. The highly purified form of resveratrol used by Vera Roasting Company is tasteless. Although CoffVee is good for you, it doesn’t taste like cough medicine! Our highest priority is to ensure that CoffVee is a premium brew that people love to drink for its flavor. CoffVee is great-tasting coffee that people would buy and love even it didn’t promote a healthier lifestyle. Absolutely! CoffVee consumers get the same amount of resveratrolin their cup of CoffVee as in a typical glass of red wine. People have been drinkingred wine with these concentrations of resveratrol for thousands of years. What is Vera's market position and pricing strategy? Vera Roasting Company’s CoffVee is roasted from 100% premium-grade Arabica coffee beans, and initially offered in three varieties of popular roasts to satisfymost flavor preferences [a Colombian Medium Roast, a Dark French Roast, and a Mayan Decaf Roast]. The brand is positioned as a flavor-equal coffee to all the “good” coffee brands, such as Starbucks and Dunkin Donuts (and beats both of them by considerable margins in double-blind taste tests). The unique heart-health benefit commands a premium price over other bags of coffee on the shelves at local grocery stores. Vera Roasting Company sells 14-oz. bags of CoffVee for $14.95 and 12-count K-Cup boxes for $12.95. The company offers discounts for volume and subscription orders ranging from 5% - 15%. What is Vera's advertising and brand promotion strategy? To date, brand promotion has been achieved through a combination of digitalmarketing and traditional advertising. Our approach to online marketing involvesa strategic attack of the online market through targeted keyword ad campaigns,and it leverages social media (both organic and paid advertising) to aggressively promote the brand and to build a grassroots movement towards the unique value proposition of CoffVee. In addition, we have aggressively promoted CoffVee at various regional trade shows and in local retail outlets through in-store demonstrations and free samples. What is Vera's customer retention strategy? Vera Roasting quickly built a core customer base of “evangelists” that arepassionate about CoffVee and loyal to the product. We implemented a robustemail marketing campaign that reinforced and encouraged the behavior ofdrinking CoffVee among existing customers. In addition, the company engages inefficient, targeted marketing to remind existing customers about CoffVee andaugment the perception of pervasiveness in the marketplace. We also offerperiodic discounts and exclusive deals for our CoffVee subscribers, reinforcingbrand loyalty. How has the company been able to bootstrap its growth thus far? Vera Roasting Company was co-founded by the New England Innovation Center (NEIC). As a Resident Company of the NEIC, Vera has the benefit of the NEIC partners' expertise, including sales, marketing, finance, accounting, strategic, and fundraising experience. As a result, we have been able to retain a seasoned team of professionals with long histories of successfully growing startups without incurring significant payroll expenses. This team is led by Mark Galvin, a serial entrepreneur who has historically delivered a cash-on-cash return of over 300% on equity investments of $125 million across four previous VC-backed companies. One of these ventures was #2 on the Inc. 5000 Fastest-Growing Companies list for its vintage. How have you guys gotten noticed in such a saturated market, and how do you plan to continue to be known? It really comes down to the big differentiation. We’ve never heard of any other coffees that have added health benefits over just plain old coffee. There are plenty of brands that position themselves as “organic” or “Fair Trade,” “small-batch roasted,” or sourced only from farms growing on mountaintops above 5,000 feet. Every other way to try to differentiate coffee has been done. There are none that are as precise and only attributable to one brand as the heart-health benefits of the glass of red wine in every cup. Because of the experience we have on our team—a published author and organic chemist—we’ve been able to file powerful process patents as well as a composition of matter patent, which is the actual molecular makeup of the brewed beverage with the resveratrol in it. CoffVee is formulated in a way that your body will be able to absorb the bulk of the resveratrol in the brewed beverage, thanks to the combination of some other natural elements from wine. You'll be getting the same amount that has been carefully tested in humans via red wine consumption throughout the ages.When we put this core message out in the world, the response we get from consumers is overwhelming. Our press release about the launch of CoffVee in December of 2015 led to an unbelievable national media frenzy that saw more than 300 media outlets pick up an AP story about our “revolutionary coffee.” It led to more sales than we could have ever imagined making in our first two weeks of business. We also had an interview on Fred Kocher’s New Hampshire Business produced and aired by our local ABC affiliate, WMUR (video here: ). It was also smack-dab in the middle of the holiday season, so it led to the single biggest sales day in the company’s history to date.Basically, when we get the word out in front of people through our media, we get big bumps in sales. Our message clearly resonates with consumers, so now we need to ramp up our marketing efforts and pursue more earned media opportunities and begin to do some advertising. That’s one of the big reasons why we’re raising capital now. When we start talking about month-over-month sales and quarter-over-quarter sales, it really comes down to when we get earned media, because we're not really doing paid advertising just yet. When we get earned media, we have big bumps in sales and subscriptions because people like it and they subscribe or they like it and they continue to purchase. Having only launched in December of 2015, we have customers that are on their 20th reorder already. 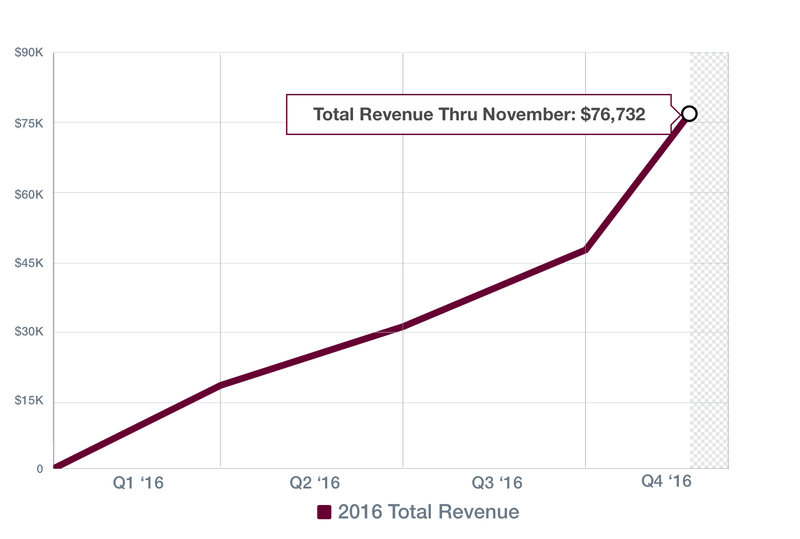 How has revenue grown since your launch 12 months ago? The company has performed beyond our expectations. We were perhaps a bit lucky when we first launched. Within a few days, there was a local newspaper article about our company and product that was picked up by the Associated Press and published in over 300 media outlets. In very short order, we were selling to customers all over the country. Within 2 days of the article, we sold to customers in all 50 states, including Alaska and Hawaii. We got off to a very fast start. We've also had some other earned media, which has been very beneficial and has helped us to grow a fiercely loyal customer base. More recently, November of this year was very meaningful to our overall success after Vitamin Shoppe sent us their first purchase order for over 100 cases of coffee. We expect to grow the relationship with Vitamin Shoppe and other national accounts over the coming year. What percentage of first time orders lead to reorders? Right now, thirty percent of first-time purchasers end up reordering. Because we have so many new customers all the time, this figure is skewed low—many of our customers are so recent that they haven’t even had the chance to reorder yet!In addition, we set up a subscription service recently. We have an increasing number of subscribers who are now just getting their coffee on a monthly basis or whatever time frame they set; every week, every two weeks, every month, etc. Once they order and they try it, they tend to like it and they tend to come back. Why raise money this way? For me, I think back to the days of Ben & Jerry's. Ben and Jerry used to let their customers buy into the brand. 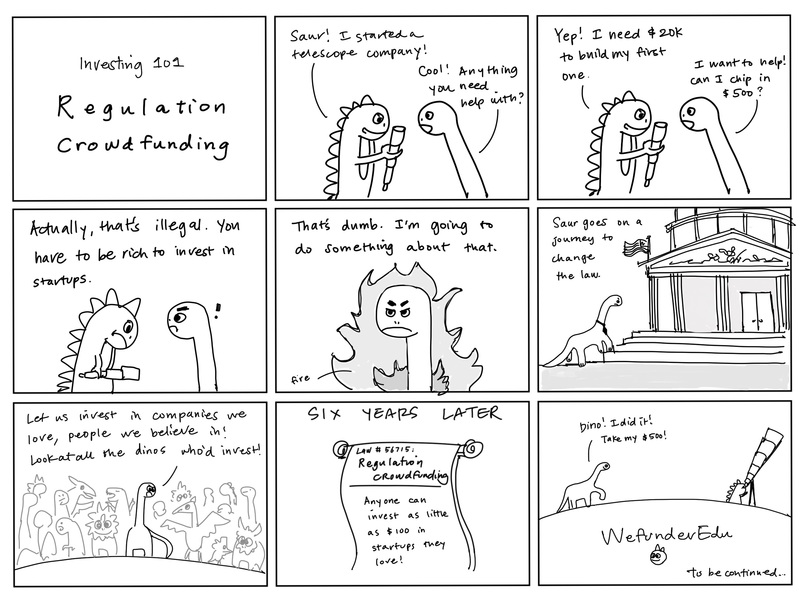 It was certainly long before there was crowdfunding legislation. I think that was the success for them, quite honestly. It makes intuitive sense that our existing customers might have an interest in getting involved a little more, and feeling an ownership of the company for which they've become a customer. It's the ideal vehicle to provide an incentive for investor customers to help proliferate the brand—to get CoffVee in people's mouths. That's when we really win—when they taste it, they're going to love it. How would funding get the word out there about your product? We'd be able to do a little more experimentation with advertising. We're looking to try to figure out ways to “capture the magic” of our earned media success to get something that makes potential customers quickly understand our message and move them to buy our product. Another way to grow our customer base is to use referral programs or other viral methods of empowering our followers—who are already subscribers that buy over and over again—communicate with their communities, their friends, and their centers of influence that they've found this incredible product, they like it, and they think that their friends should try it, too. Along those lines, we’re offering our best customers the opportunity to send a free order of CoffVee to their friends to proliferate the brand.Of course, we also think that using Wefunder is another interesting way to get our message out there and make an introduction to new potential customers. How will this funding be put to use? We'd like to have some buffer in our cash position to be able to invest in working capital in advance of gross profit coming in to pay for it. For example, to take on large national accounts, we need to grow our inventories and/or production capacity to be able to quickly ship fresh product. Depending on the payment terms we are offered, and to stay current on accounts with our own suppliers, we may also need to increase our investment in accounts receivable. The cash infusion from this fundraising event will enable us to make those investments.To facilitate this growth over the next six months, we plan to open a new pack and ship facility with more storage and production capacity. It will allow us to absorb some of the functions currently performed by our co-packer, which will save us money while reducing our order lead times in the process.Finally, we would like to invest in our marketing, advertising, and customer outreach. A key determinant of success for our retail channel partnerships is the frequency of brand awareness activities in their geography. Considering all of our wholesale customers, the geography that we have to cover is fairly wide, and growing. This presents a challenge, and we want to ensure that we have capital to invest in these marketing activities, driving success in all of these new channels. Obviously, we don't have a lot of interest in supplying a channel with product, having it not sell through, and that being the end of it. On the direct-to-consumer side, our approach to online marketing has historically involved a strategic attack of the market through targeted keyword ad campaigns, and leveraging social media (both organic and paid) to aggressively promote the brand and to build a grassroots movement towards the unique value proposition of CoffVee. We would like to experiment with new marketing messages via Google Adwords, Facebook, Twitter, Instagram, Amazon, or even television advertisements. What are the qualifications of your executives? Mark, President & CEO, is a serial entrepreneur who has previously done four venture capital-backed companies that made it to rapid growth rates that would put them in top 100 fastest growing private companies in their vintages. He excels in equity fundraising, team building, rapid-growth business management, system architecture, matching technologies to business needs, and developing market channels. Mark is currently serving as Managing Director of the New England Innovation Center, LLC, of which Vera Roasting Company is a resident company. 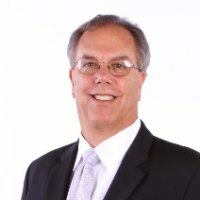 Glen, CTO, is a full professor at the University of New Hampshire and he is currently the Chair of the Chemistry Department. He is very well respected in the field of organic chemistry, with over 60 scientific papers published in leading journals, and over 200 presentations at national and international meetings. They met a few years before starting Vera Roasting Company when Mark was involved with an entity called the New Hampshire Innovation Commercialization Center, the primary function of which was to find commercial opportunities for technologies developed within the University of New Hampshire. Glen is responsible for some of the better stuff that has been done at UNH in material sciences and organic chemistry and he met Mark while investigating the market opportunity for a technology based on UNH intellectual property. What is your current run rate / burn rate? As of December 2016, we had approximately $10,118 cash in bank. We currently operate at a "burn rate" or "net cash in" (difference between expenses and revenues) of approximately $-10,000 to $5,000 per month. Current investors are committed to the company and willing to cut the company checks to keep it solvent in these early stages, if needed. It is not something that we've asked them to do yet, though. Our cash in hand is $18,530, as of December 2017. Over the three months prior, revenues averaged $6,458/month, cost of goods sold has averaged $4,175.25/month, and operational expenses have averaged $11,483/month. Vera Roasting Company, Inc. was incorporated in the State of Delaware in September 2015. Our company was organized in September 2015 and has limited operations upon which prospective investors may base an evaluation of its performance. Revenues & Gross Margin. For the period ended December 31, 2017, the Company had revenues of $77,490 compared to the year ended December 31, 2016, when the Company had revenues of $89,107. Our gross margin was 35.34% in fiscal year 2017, compared to 41.95% in 2016. Assets. As of December 31, 2017, the Company had total assets of $41,696, including $18,530 in cash. As of December 31, 2016, the Company had $41,696 in total assets, including $9,297 in cash. Net Loss. The Company has had net losses of $111,809 and $21,131 for the fiscal years ended December 31, 2017 and December 31, 2016, respectively. Liabilities. The Company's liabilities totaled $17,572 for the fiscal year ended December 31, 2017 and $24,323 for the fiscal year ended December 31, 2016. To-date, the company has been financed with $168,775 in SAFEs. Vera Roasting Company, Inc. cash in hand is $18,530, as of 12/31/17. Over the last three months, revenues have averaged $6,458/month, cost of goods sold has averaged $4,175/month, and operational expenses have averaged $11,483/month, for an average burn rate of $9,200 per month. 1 Supply Chain Risk – Our current supply chain relies heavily upon a single co-packer located near our head office in New Hampshire. As we have no existing relationships with other co-packers in our area, the failure of our co-packers’ business or the loss of their cooperation could lead to an immediate and/or lengthy disruption to our supply of freshly roasted coffee. In such an event, we may be forced to contract with another co-packer on unfavorable terms or even be unable to find another coffee roaster to prepare our roasts to our specifications. 2 Cost of Goods Sold Risk - The prices we pay for the green coffee beans we use to craft our premium roasts are indexed to the cost of “C” Coffee futures, a commodity which has exhibited substantial volatility in price over the past few years. This risk is not hedged in any way and we have no plans to do so. Substantial increases in the price of the underlying commodity, such as those that might be driven by natural disasters or global financial/political crises, may reduce our profitability and/or the quality of product we are able to bring to the market. 3 Patent Risk – We have made a submission under the USPTO’s Prioritized Patent Examination Program for a utility patent covering the composition of matter and process used in the production of our product, CoffVee. If the patent were denied, there is a risk that a competitor could offer a similar product with the same heart-healthy differentiation we claim to have developed. 4 Competition Risk – The specialty coffee market is very competitive with many incumbents. There is a risk that we will be unable to differentiate ourselves from other players in the specialty coffee space in a way that leads to long-term recurring sales and growth. be able to sell their interest in the company. Additionally, it is possible that the company will require multiple follow-on financings as we continue to develop the business, some of which may be dilutive to investors in this round. At the current time, the company has no target date for a liquidity event. Investors should expect to commit their capital to the company for an extended period of time. at a level of compensation we can afford. 7 Spoilage Risk – Although coffee is a fairly shelf-stable product, there is a risk that a portion of an outsized production run of CoffVee could expire before being sold. 8 Lack of Operational History – Although a team of experienced entrepreneurs leads the company, none of them have ever been involved in bringing a retail food product to market. There is also limited proof of the business model—there is no certainty of the number or persistence of consumers interested in buying a resveratrol-infused coffee. 9 Shift in Perceived Health Risk – For the last 20+ years, the supporting science and public perception have billed the consumption of red wine—and resveratrol, specifically—aspart of a healthy diet. Overwhelming numbers of studies have shown resveratrol to be a powerful antioxidant that may contribute to improved cardiovascular health, neuromuscular health, cognitive function, and overall fitness. Still, there is potential for new research to emerge and dramatically change the perception of resveratrol in the market. Furthermore, new research could emerge and dramatically change public perception towards coffee overall. Unforeseen changes in market affinity for coffee could significantly impact Vera’s sales and customer loyalty towards CoffVee. 11 The founders and officers are not currently full time with the company. As such it is likely that Vera Roasting will not make the same progress as it would were that not the case. $25,000 At $25,000 raised, we will use the proceeds to invest in paid advertising, especially through Google AdWords and YouTube, while learning the best way to reach our customers. $50,000 At $50,000 raised, we will hire brand ambassadors to create customers on a more personal basis. These individuals will be teaching consumers about our new product at both special events, such as trade shows and athletic events, as well as via their everyday presence staffing carts with samples and product to sell in some of the busiest spots in New England. $100,000 At $100,000 raised, we will produce video advertisements for placement on local and regional cable television. The ads will be aimed towards our target market, those 45 years and older with disposable income and interests in health and wellness. $200,000 With any amount raised over $100,000, we will invest in capital equipment to build out our production and shipping facility with commercial-grade grinders, mixers, and automated packing equipment. CoffVee has become all that I drink. Not only does it taste great, but the added health benefit of the resveratrol makes me feel even better about the choice that I am making! I love that it comes in K-cups, ground, or whole bean, and the company makes it easy to send as a gift! We've been buying the Vera medium blend beans routinely for more than a year. It has become our go-to daily coffee. Outstanding product and great service. I love CoffVee so much that I've told all my friends and family about it! You wouldn't believe how many times I've been told it's there new favorite coffee. They absolutely rave about the taste (medium, dark, and even decaf), and the added heart-healthy benefits truly makes drinking CoffVee a no-brainer! Why drink regular coffee when you can drink CoffVee? I know I will only drink CoffVee from here on, it's just that great! My husband and I have been drinking CoffVee for about a year now and we love the rich delicious coffee and the added health benefit of resveritrol. We enjoy the heart healthy results of drinking CoffVee every morning!! Excellent coffee! Smooth, not bitter. My previous routine included Dunkin Donuts every morning, but CoffVee has replaced that! Hi I am Tom Quinn and live in Exeter, NH. I tasted your product at "Taste of New Hampshire" fell in love with your coffee a few years ago. I have been on auto ship since then. I am the Vice President of Retail Sales for a Seafood Company headquartered in Maryland. I just invested. Hi Glen, Mark Looking forward to increased Success! Thanks again for taking the time to answer my questions. I suggest that you consider getting this product in the hands of influential podcasters/writers who focus on health like Tim Ferriss. His product endorsements are really powerful (he once endorsed a brand of sardine resulting in it selling out in Whole Foods across the States). Engineer working as a Senior Analyst in Surety Claims. Investing in my personal time as a passion project. Hi Glen & Mark , when will I receive the product ? I 'm Jason Bui ,live in Oklahoma City. OKLAHOMA. I am a licensed CPA in the states of Florida, Virginia, and North Carolina. I have my own CPA firm near Greensboro, NC with 6 digits in annual billings. Tell friends about the offer and the healthy coffee. Hi- I saw your spot on WMUR this AM. I'm a health teacher and come from a family of coffee drinkers. I am convinced of the health benefits in both coffee and red wine. I stopped drinking alcohol 30 years ago and love this idea. I'm excited to be part of team Coffvee! I wonder what happens to my investment if someone buys your company? Hello Glen and Mark, I recently viewed Glen on NH business and happy to help a some what local business and even happier to know it is for coffee. I drink coffee as so as I wake and as my head hits the pillow. I would be honored to help in any way I can. Hello Gentlemen, I own a small real estate office in NH. I saw you both on WMUR this morning and love the idea! Hoping for a great future for you and Coffvee. Best, Mick Pinard Atomic Real Estate LLC. Video Transcript >> WELCOME TO NEW HAMPSHIRE'S BUSINESS. I'M FRED KOCHER. IN A MINUTE WE'LL TALK ABOUT THE NEWEST START-UP. LOOK AT THE NATIONAL GROUP SAYING THAT BUSINESS START-UP ACTIVITY IN THE U.S. ROSE THE FIRST TIME IN FIVE YEARS DURING 2015 WITH THE LARGEST YEAR OVER DECADES. THAT'S AMAZING. Portsmouth, NH (PRWEB) February 10, 2016 Vera Roasting Company, Inc., the only producer of coffee infused with resveratrol, today announced expanded production capabilities for CoffVee, a master-roasted coffee, making it the fastest-growing specialty coffee in its class. CoffVee gives consumers the opportunity to enjoy the heart-healthy benefits of a glass red wine in every cup of their morning or daytime brew. Megan Parry We've all probably looked at the clock on a particularly bad Monday morning at the office and wished wine wasn't frowned upon as a morning beverage choice (it's five o'clock somewhere, right?! And red wine helps with memory, so... productivity?!). The beans are infused with resveratrol, the same compound found in grape skins. The benefits of red wine and coffee are together at last! No, it's not a coffee that gets you drunk (the Irish already came up with that, or at least lent their name to it). Instead, an organic chemist claims he's created a cup of joe that has the added benefits of resveratrol. PORTSMOUTH, N.H. - An organic chemist currently serving as chair of the University of New Hampshire's Chemistry Department has developed a coffee that provides the same amount of antioxidants found in red wine. The Portsmouth Herald reports Glen Miller's Vera Roasting Co.
PORTSMOUTH, N.H. (AP) - A University of New Hampshire chemist says he's developed a coffee that provides the same benefits to the heart as red wine. The Portsmouth Herald reports ( http://bit.ly/1IPkfKm ) Glen Miller infused Arabica coffee beans with resveratrol, the natural antioxidant found in the skins of grapes used to make red wine. A University of New Hampshire chemist says he's developed a coffee that provides the same benefits to the heart as red wine. The Portsmouth Herald reports ( http://bit.ly/1IPkfKm ) Glen Miller infused Arabica coffee beans with resveratrol, the natural antioxidant found in the skins of grapes used to make red wine. Thanks for vouching for Glen! If you'd like to invest in Glen, please open an account. We'll waive your fees if you do it now. We asked Glen for 10 personal references. Can you vouch for Glen?